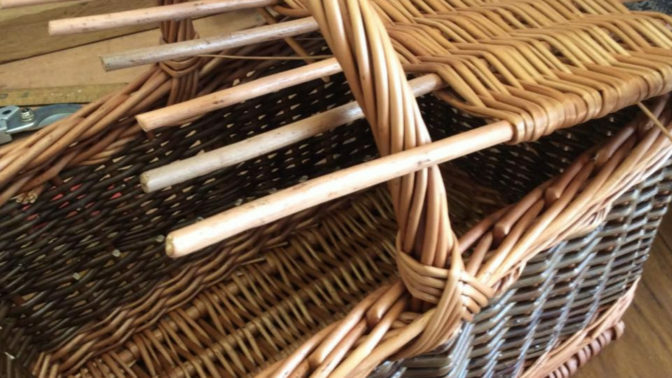 In a course for basket makers with some previous experience, Sarah Webb will guide you through the steps to make a square picnic hamper complete with handle and lids. More accomplished makers will be able to experiment with differing weaves to create pattern and texture, and you’ll leave having learned the techniques to continue on your own. Square basketry is regarded as the most tricky, and making a ‘shooter’ basket is quite a challenge! However this course offers a generous amount of time in the studio – an introductory session on Tuesday evening, two full days on Wednesday and Thursday, and Friday morning to finish-up before lunch – so there’s no need to rush, you can concentrate and take your time. With Sarah’s patient and good-humoured teaching, and plenty of graft on the students’ part, everyone should be able to complete a beautiful and functional picnic basket. This course is aimed at Intermediate level makers and above. You’ll need a good grasp of basic basketry techniques, eg having made round or square baskets in previous courses. The advantage of this course over others is that we have time on our side!